In September I will be going to Europe for the first time and have decided to throw in a visit to Istanbul at the end of the trip. I’m a student and so my budget for travelling is limited, but, as I love food, I’m not exactly crazy about partaking of the classic backpacker “soup of the day” thing (one bowl of soup for the whole day). I was hoping you guys at Istanbul Eats would know of a few places that strike the happy middle ground of being delicious cheap eats, but in places where the local flair can be soaked up at the same time. Thanks! Although our own student days are, sadly, long behind us, we still approach every day as if we still had a pack firmly attached to our back. Now, as then, our daily culinary mission remains the same: How to maximize our eating pleasure while minimizing what we spend. So, in that sense, you will find that most of the spots reviewed on Istanbul Eats are backpacker-friendly, with memorable food served along with friendly prices. That said, a few more specific tips to keep you from having to get more cash wired from home. While Istanbul has long been a major stop along the backpacker route, the city is no longer the budget destination it once was, with prices often surpassing those found in many other European cities (especially when it comes to coffee and booze). But it’s still possible to eat your way through Istanbul without being left completely broke. Many büfes will have on offer another ubiquitous Turkish dish, kuru fasulye (white beans in a tomato sauce). In this case, spend a few extra liras and treat yourself to the stellar and infinitely tastier Black Sea version of this dish. For our money, the buttery beans at Hayvore, a wonderful and affordable Black Sea restaurant in the Beyoğlu area, are among the best in the city. The Black Sea area is also famous for another delicious yet budget-friendly item, pide (sometimes referred to as Turkish pizza, although the two are not quite the same). Fatih Karadeniz Pidecisi is not only one of the best and most authentic pide spots in Istanbul but is also located in an atmospheric neighborhood rarely visited by tourists. Of course, this being Istanbul, you will probably expect to eat some kebab. Sitting down for a proper meal at an Istanbul grill house will likely leave you at the end of the night staring dejectedly at a budget-busting bill. A better bet is to follow the lead of hungry late-night revelers and head to Dürümzade, a small and affordable joint near the bustling Beyoğlu fish market that makes superlative dürüm (kebab wrapped up in a flatbread). As your days in Istanbul pass by and you find yourself staring at the beautiful waters surrounding the city, you will likely start craving some fish. Like with kebab, going out for fish at most waterside Istanbul restaurants will leave you with serious sticker shock. In this case, we suggest you find your way to the central square of Samatya, a sleepy neighborhood by the shores of the Marmara Sea, where the owners of tiny Küçük Ev will serve you up a fresh fish dinner for a fraction of what you would pay in restaurants up the Bosphorus. 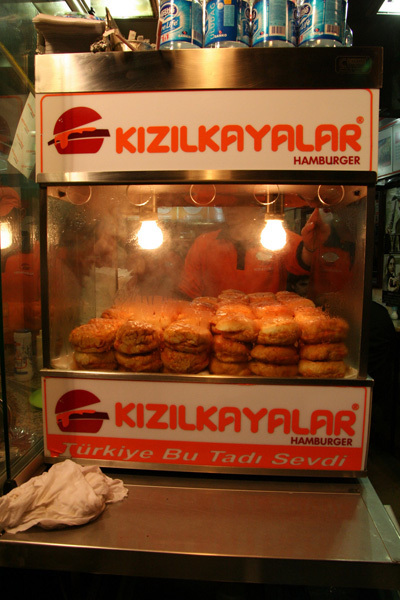 Finally, no discussion of Istanbul cheap eats is complete without talking about the “Wet Burger” (“Islak Burger” in Turkish, pictured above), Turkey’s greatest contribution to the world of fast food. A garlicky beef patty that resides inside a fluffy white bun that’s been soaked in an oily, tomato-based sauce, the “Wet Burger” is a budget eater’s dream come to life: cheap, sloppy, delicious and utterly addictive, a taste memory that will stay with you long after your cash has run out and you are back on campus hitting the books, your thoughts slowly turning towards planning next summer’s vacation. When you talk about eating cheap in İstanbul, you have to mention “simit” “börek” and “sokak pilavı”.